Sitting nook overlooking gulf and pool. 21 ft. long x 12 ft. wide, the depth is 3.75ft to 5.3 ft. deep. 21 ft. long x 12 ft. wide, the depth is 3.75ft to 5.3 ft. deep. Castle in the Sand East is a gulf front home located in Orange Beach AL.This home features a private pool in the south deck over looking the gulf, gas & charcoal grill and over 5000 sqft H&C and another 2000+ sqft of covered porches and decks. "Castle in the Sand East" is a stunning new gulf front development that's located in one of the best locations along Alabama's Gulf Coast, in Orange Beach AL. 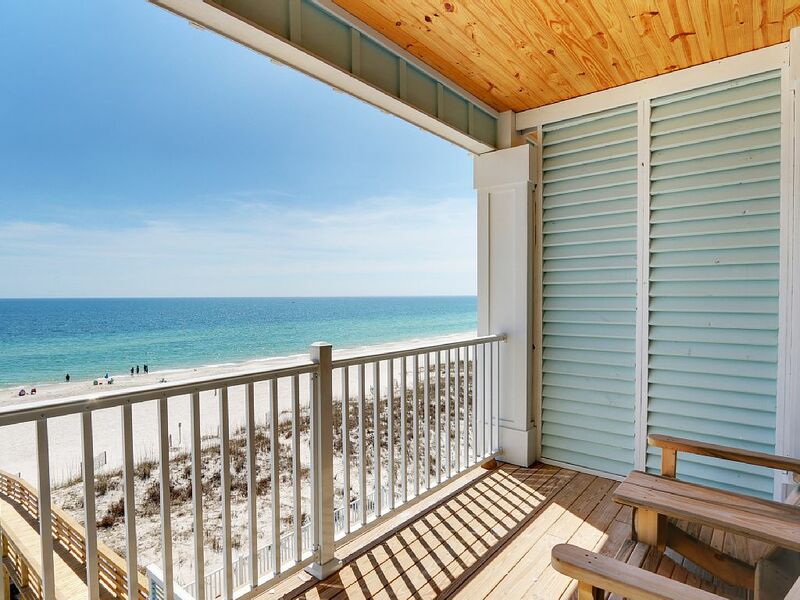 This brand new property features an East and West unit, and when both sides are rented, is one of the largest properties along Alabama’s Gulf Coast. Each side will accommodate 14-26 guests and is one of the best values in the entire area when compared with comparable properties. This home sits approximately half a mile West of the Florida/Alabama state line and one mile to the East of the Perdido Pass Bridge in the heart of Orange Beach. 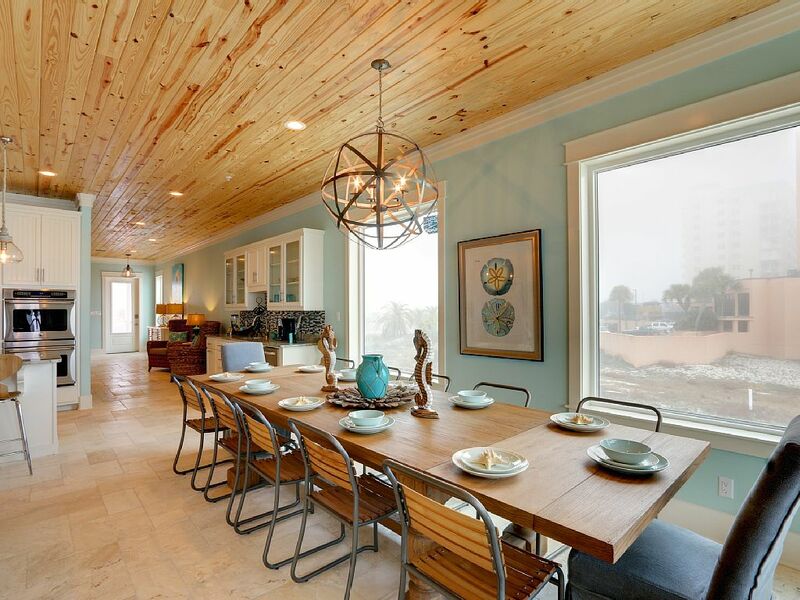 Castle in the Sand East features a gulf side private heated pool, 6300 sqft under roof, Willington 304 stainless steel natural gas grill designed to hold up to the salt air better. There are 5 private covered balconies on the south side of the home, and their are two additional private covered balconies on the north side of the home that offer incredible views of Ole River. The kitchen features a gas cook top with 5 gas burners for families who love to prepare their own meals and do not enjoy fighting the crowds at the restaurants. The East side of this gulf front development has 9 bedrooms, 8 full baths,2 half baths, and an oversized den and sitting area with a 65 inch flat screen SMART TV along with a Blu-Ray DVD player. There is also a separate entertainment room/ den on the 3rd floor that has a 55 inch flat screen SMART TV, which also has a Blu-ray DVD player. All the bedrooms have 42' SMART TV's and a large selection of channels through DIRECTV. The home also has WIFI boosters on every floor designed to help guests have a stronger Wifi connection throughout the whole home and even on the balconies and decks. Some of the homes amenities include 2 refrigerators, 2 dishwashers, 2 ovens, a gas range cook top stove, free standing under counter ice maker in addition to the two ice makers in the refrigerators, full sized washer and dryer, natural gas stainless steel grill (no tanks to worry about refilling) , additional aluminum in ground charcoal grill under the home, a custom private pool (heated seasonally for $125 fee), and dune walk over from back deck to the beach. 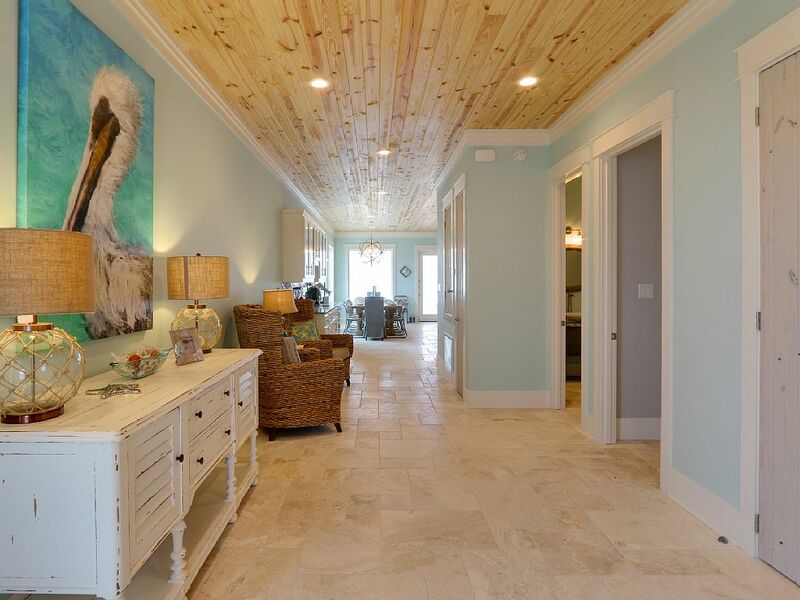 The home is finished with 8 ft. custom pine doors throughout the property, travertine floors on the entire first floor and in all bathrooms, and true pine hardwood floors throughout the remaining floors. There are 5000 sq. feet of heated and cooled space, OVER 1300 sq. feet of PRIVATE covered porches for a total of 6300 sqft under roof and there is also a nice sun deck around the private pool overlooking the beach on the East side of this gulf front development. There is a privacy wall built between each south facing bedroom balcony and there is also a 9 ft privacy wall on south deck separating the gulf front pools and porches, which offers a lot of privacy. There is also a freshwater shower on South side of privacy wall for guests to wash sand off their feet and beach toys. The pools dimension's are 21 ft. long x 12 ft. wide, the depth is 3.75ft to 5.3 ft. deep. The first floor features a well-appointed kitchen, a spacious den and dining area, and one bedroom with a king bed (ideal for elderly guests that do not wish to travel up many stairs). The home is not ADA accessible but once inside on the first floor, there in a large master bedroom on first floor with walk-in shower and there are no stairs to navigate once inside the home when going to the pool and beach area via the dune walk ramp on the south side of the house. The kitchen has a wet bar with a separate sink and ice maker underneath. There are 2 refrigerators as well as 2 dishwashers, so you can stock up on groceries and limit trips to the grocery store. A full sized washer and dryer are also located on the first floor. The den features a cozy sitting nook and 6 grand oversized windows that offer incredible views of the white sandy beach and afternoon sunsets! The second floor features 4 bedrooms, as well as 4 full private baths. Three of the rooms have king size beds, the king bedroom on north side of second floor also has a separate twin bed in the room and the fourth room is complete with 2 twin beds. The two south bedrooms with king size beds both feature private gulf front balconies! The two north bedrooms have balconies as well, that overlook Perdido Beach Blvd. and Ole River and offer gulf views looking down the beach. The third floor features 4 bedrooms, two of which have king size beds, private baths, and private balconies with a bird's eye view of the beautiful gulf! One bedroom features 4 sets of custom built- in bunk beds (sleeps up to 8 ). This bunkroom is perfect for children! Across the hall is a bedroom with a twin over a full bunk bed, this room could sleep up to three children. A full bath is shared between the two bedrooms with bunks. Located near the two bunkrooms is an entertainment room that features a 55 inch flat screen tv and sitting area, with an accompanying half bath. 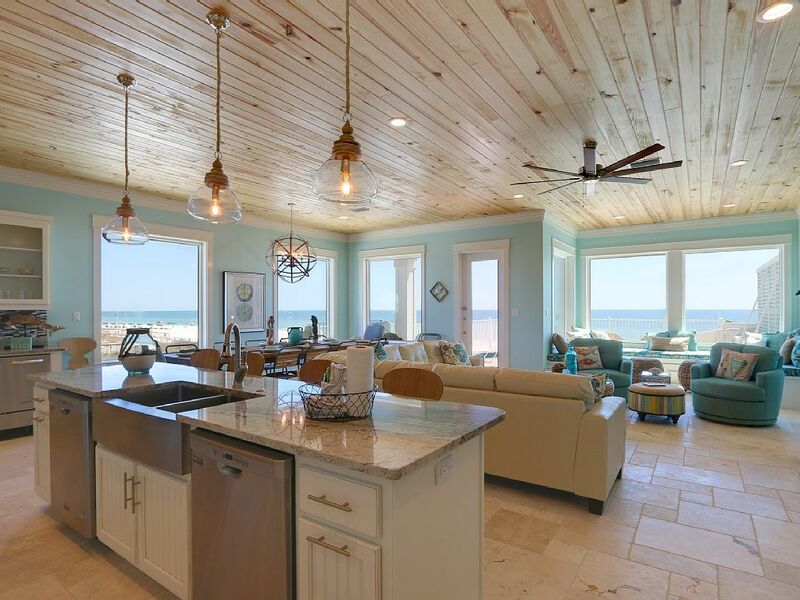 This one of a kind beach home is perfect for a multi-family vacation! 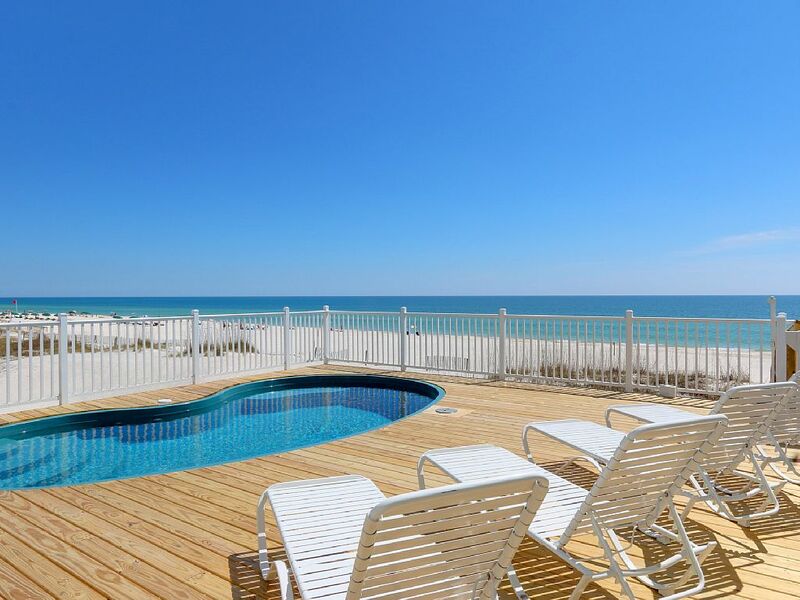 Keywords: Orange Beach Gulf Front Beach House, Gulf Shores Beach House, beachfront home, private, luxury home, private heated pool, orange beach, gulf shores, direct gulf front. Wedding Friendly with additional fee on approved events, Corporate Retreat. This property has 6 King(s), 1 Full(s), 12 Twin(s). What an incredible house! Our entire family was able to be with me to celebrate Christmas on the beach for a week. It was our first Christmas without my husband and we wanted to get away and do something different this year. The house was beautiful and provided enough space for our large family. Great memories were made. Greg was easy to work with and was very accommodating. Would definitely recommend to anyone looking for a nice, clean, well decorated house with beautiful views. Great house on the beach. Perfect location. Plenty of beds and bathrooms. Great deck/ pool with view of the beach. We had a great fall break beach trip in OB. Castle in the Sand East has everything we could have ever needed. Our four families loved the pool and the beach access. We would love to return in the near future. Beautiful house. I don't know if we could be happy with any other place now that we've stayed in the castle in the sand. We had 18 people who never got in each other's way. When the kids weren't at the beach or in the pool, they were loving their bunk rooms and gaming time. We really could not have been happier. Thanks for creating such a wonderful setting! Hi Greg! We loved your house. What a beautiful property! We built many family memories and had such a wonderful time. I certainly hope we will be back! Very clean and impeccably decorated. The kitchen was stocked with everything you could need. We are loaded up and headed home. We had an incredible time. The house was gorgeous and fit our group perfectly. The weather even cooperated. Next year our group celebrates our 10 year beach reunion and we are headed to Jamaica. But 2020 we will be back!!! Thank you so much for your hospitality. We recommend you to all of our friends. We had an AMAZING time at Castle in the Sands. The house was beautiful! Everything was in working order. The double refrigerators and dishwashers was very helpful!! I cannot say enough about this house. If you have a large group with lots of small kids this house is great!! Short distance to the beach. Rooms are spacious for pack n plays for small children. Lots of seating to eat dinner together. We had a great time!! A little about ourselves.. we are a group of cheerleaders, senior team, coaches and parents. We were attending US finals in Pensacola. This house was everything advertised and more. Our group tends to be loud by nature but with all the space and 3 floors in this house you didn’t notice it. Plenty of room to gather in groups for eating and meetings but enough to spread out as well. All appliances worked, the house is centrally located between Alabama and Florida yet had no direct next door neighbors. Communication with the owner was excellent. I am dealing with another rental for this weekend ( other Cheer team in Florida) and this owner makes me really appreciate his communication skills. The private pool really sets this property off from others. There were many friendships strengthened over a drink and “family” bonding poolside. If you chose this home for your next vacation get away you will not be disappointed. he house was absolutely perfect for a week’s vacation with our best friends and all our kiddos! The kitchen/family room/and pool area provided great hangout spots when we wanted to be together and all the bedrooms and upstairs tv area were great when we were in need of a bit of separation. Very appreciative of the beach chairs &boogie boards that were provided as well! This was our second time at Castle in the Sand East, and it was all we remembered and more! It is such a beautiful, spacious home, with all the amenities of being at your own home. Greg was great with sending helpful information for the area, and he helped right away if we needed any thing at all. We were a group of 22, (10 were children) and there was more than enough room for everyone to spread out. Every detail about the house, from the great kitchen & finishes, to the swimming pool & private beach access, to the multiple master suites...completely sets this home apart from the others we looked into. We visited The Hangout, FlorAbama and Tacky Jacks, and enjoyed them all. We hope to visit again one day! It was absolutely perfect! The house itself and the location are literally what anyone could hope for. I've had plenty of folks asking about it so they can rent it for their own vacations, including home of the guests that stayed with me over the weekend! Thank you again. We will be back for sure! To sum up the house in one word I would say ama zing. The place looks exactly like the pictures. We had a great time the house was great definitely thinking about visiting again in the future!! We all agreed that we truly enjoyed our stay at castle in the sand east. The home is exactly as advertised. Our group loved the location of this house, the layout, furnishings, and views!! The large glass windows allowed us to have incredible unobstructed gulf views from almost anywhere inside the home. The home was very clean upon arrival and had detailed instructions on what we were asked to do upon departing so the next guests would have a pleasant stay also. We have visited several homes along the coast, but this home seemed to have it all! The location was AWESOME and the layout of the bedrooms and balconies allowed everyone to spread out when needed. We hope to travel back soon. The pool and boardwalk were also very convenient and laid out nicely. Greg we had the best time at this residence. The number of rooms and the layout of the main level accomplished everything we wanted it to do with the 5 families we had there. The kitchen was conducive for us having a ton of fun making meals together. The pool was simply wonderful to be able to enjoy. We all had a wonderful time there. You have a beautiful facility on a magnificent location. I am sure you will make loads of families very happy going forward. My entire family, including my parents who are in their 70's, very much enjoyed our stay at Castle! Grandma and pops loved the bedroom on the bottom floor, and the kids loved their stay in the bunk beds (which are big enough for adults if needed) and swimming in the private pool! The boardwalk over the dunes to the gulf is awesome. We could pack up all of our belongings for a beach day and conveniently take everything across the boardwalk to the beach. The open floor plan allowed our whole family to gather together downstairs to eat with plenty of room. We never felt overly crowded, and it was easy to have your own space because of how many bedrooms there are. We were all sad when the trip came to an end. Great times in a great home! This house is just perfect! Everything inside and out is beautiful and clean! We were there for a week with 4 other families, all with young children and we loved the house! The pool was one of the best features, while kids were napping we could use our monitors and hang out by the pool! We hardly ever even saw the people that were staying on the other side, it never felt like a duplex! I cannot say enough great things about this property! 24 family members stayed at Castle in the Sand east this summer. The house was absolutely gorgeous!!! The pictures do not due it justice. Beautifully decorated and very clean. All the emenities you could want or need. Perfect location. Love this house!!!!! After going to Gulf Shores for twenty years, we have finally found the perfect beach house for our large, extended family. Castle in the Sand is beautifully decorated and well-equipped with everything needed. There are five master suites with their own bathrooms and four other bedrooms, two of which are bunk rooms--perfect for our grandchildren. The kitchen is great, with two dishwashers, two refrigerators and plenty of dishes and utensils for cooking if you decide to eat in. If you want to eat out, there are plenty of nice restaurants within ten minutes of the house. The house is right on the beach, with a walkway out to the beach. And there aren't any houses nearby, so it's like a private beach. The pool is perfect for a large family, and the views from the house are spectacular. I highly recommend this fantastic house--we have already reserved it for our family reunion next May. This house was amazing. From the layout, furnishings, decor, double appliances, multiple king bedrooms with a view, private pool with ocean front location, and most importantly a Christian atmosphere......who could ask for more. We were blown away from the moment we stepped into this home. I have never stayed at a vacation home that was so well thought out and equipped. We had an amazing time and are already talking about booking for next year. We had an absolutely fabulous vacation thanks to this house and its location. The home is gorgeous, well equipped and situated right on the beach. The King suites with private baths and private balconies facing the beach were a huge hit. The kitchen was amazing. The 2 refrigerators, 2 dishwashers, 2 ovens and other amenities made meals and clean up so much easier for our group of 17. The heated pool was a wonderful treat for the 10 kids. The beach is just steps away and was amazing. Shopping and restaurants were convenient to the location. We had an amazing time and have already booked the home for next year. My family had the best vacation ever!! !Everyone was so happy with the castle in the sand east. You thought of everything.We have never stayed in a house so well equipped for a large group. The decor was beautiful.It had a wonderful Kitchen and a table large enough that we could eat our meals together.The pool was a great size to cool off after a big beach day.Our neighbors were great and we had several volleyball games together. I would give this place 10 stars and recommend it to everyone I know. Thanks for wonderful week in your awesome place. The pictures don't do this home justice, we can't say enough good things about it!! There isn't one thing I would change , this is the best location for any beach house we have ever stayed! 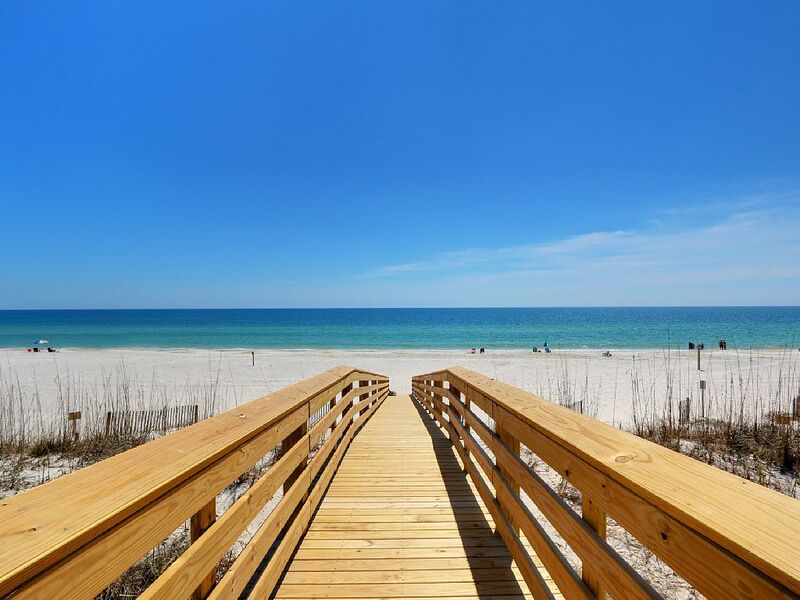 It's convient to Gulf Shores, in the heart of Orange Beach and Pensecola is only 15-20 minutes away! We drove over there and bought fresh fish from a great local fish market Greg recommeded. We are not big partiers or drinkers at all, but we did enjoy walking down to the Flora-Bama at sunset and grabbing a drink and listening to some music , then heading home for a glass of wine by the heated pool, while the men cooked out on the gas grill. We would then retire to the den for a movie and the kids would go upstairs to watch a movie in their den. We loved the location, ALL the nice amenities , and the location simply can not be beat!! We are go glad the condos weren't build on this lot and that the owners decided to rebuild a residential house !! Thanks again Greg, looking forward to next year.. In years past we have rented 3 condos.Not this year!! We all stayed together and had more than enough room!! We loved the home and it is better than advertised!! All the beds are nice and VERY comfortable, the TVs are incredible, and the overall decor of the home is nicer than iv ever seen in a rental home along Alabamas gulf coast! The heated pool was amazing, my family enjoyed it every day, the pool water averaged 84.7 degrees, which is more than warm enough this time of year. The views are incredible also, we could see water out of every bedroom! Overall, there isn't a negative thing about this home, we all loved it and hope to be back next year. Just wanted to let you know the wedding was perfect. 40 on one side of the deck for the reception dinner. Conversation areas for after dinner. Betty and I have photos we will send later. Our family recently visited this amazing property for a week in early March and it was one of the most enjoyable family trips we have had in years. The home was clean and the furniture , accesories and appliances were not only brand new ,but also very high end , especially for a rental property. All the bedrooms were very spacious and the layout of the home is perfect. It reallys allows everyone to spread out. There was another group on the west side of the home and we didn't even know they were over there. It's truely like two separate houses that share a parking lot out front. All the rooms have large tvs and direct tv. We loved this home and can't wait to hopefully visit again real soon!! Thanks for a great stay Greg! If you only have one beach vacation this year choose this property! Not only is it gorgeous, the owners have thought of everything to make your stay enjoyable. The beds are great, the bathrooms better than mine at home and the kitchen... well that's a story in itself. I don't like to cook when I'm on vacation but with a kitchen like that, I would have to make an exception. It was too cold and rainy for swimming but a private heated pool overlooking the beach- my kind of relaxing! Ask them to leave you a list of restaurants in the area. There are some great ones! Enjoy.